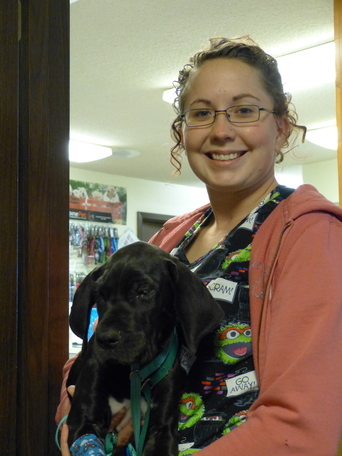 Cindy started with Spring Meadow in September of 2008 as our groomer and is now also our Kennel Supervisor. Cindy recieved her Veterinary Technician degree from Columbus State Community College and is a graduate of the PennFoster Grooming program as well as being certified in pet massage. Cindy and her husband Dave have four children, Kyle (Daughter-in-law Addie), Hannah (Son-in-law Tim), Rachel & Stephen. Outside of work Cindy enjoys spoiling her granddaughter! Some of Cindy's four-legged children include a Rottweiler named Grace and a cat named Peaches. Bailey is a 2018 graduate of Loudonville High School and joined our team in September 2018. She will be attending Cedar Valley College starting in Spring of 2019 to become a Veterinary Technician. Bailey has a wired hair Pointer named Buckeye and a Netherland dwarf bunny named Paisley. Deb began working at Spring Meadow in October 2007 as one of our kennel attendants. Deb and her husband John have 3 kids, 10 grandchildren, 3 dogs and 2 cats. In her spare time Deb enjoys attending her grand kids activities, reading, gardening, watching the Cleveland Browns and just spending time with her family. We welcomed Sami in 2017 as a kennel attendant. She is currently training to become one of our veterinary assistants and is looking forward to starting school to pursue her degree as a Registered Veterinary Technician. Sami's pet family includes two dogs Bruno & Maya. Tiffany joined our team as a kennel attendant in June of 2018. She and her husband hava a daughter Lucy, 3 dogs (Neda, Willow & Cole) and 4 cats. Tiffany enjoys gardening, reading, camping and spending time with her family and has a master's degree in Education. Paige joined our team as a kennel attendant in March of 2018. We welcomed Kaitlin in February of 2018 as a kennel attendant. She is currently a student at Ashland University majoring in Toxicology and plans to attend Veterinary school. Kaitlin enjoys playing tennis. At home she has 2 cats and a chihuahua as well as 2 younger siblings.